I began writing Regencies long before the advent of Google Earth. It seems almost quaint, now, to think of relying on paper maps to get a sense of setting, but that’s what we used to do. I was thrilled to discover Darton's New Plan Of The Cities Of London, & Westminster, & Borough Of Southwark, 1817 online when I began writing my first book, The Nobody, and spent countless hours poring over it. The Nobody was set in the spring of 1818 so this, of all maps, was pure gold. Of course, one of the reasons why it took countless hours to study the map was that I had a dial-up connection to the internet. Each view of http://archivemaps.com/darton1817/darton.htm took between six and ten minutes to load. But it was well worth it, and I waited patiently as each fragment of street slowly materialized on my screen, spellbound as Regency London spread itself before my fascinated gaze. Based on the meticulous drawings I perused, I set my country-bred heroine’s aunt in Half Moon Street (easy walk to Green Park! ); sent her, while visiting said aunt, to a party in Audley Square; tempted her to ignore the conventions, bolt out of the party and walk home down Curzon Street; and taught her a lesson by having her rudely accosted somewhere near the corner of Curzon and Queen Streets. 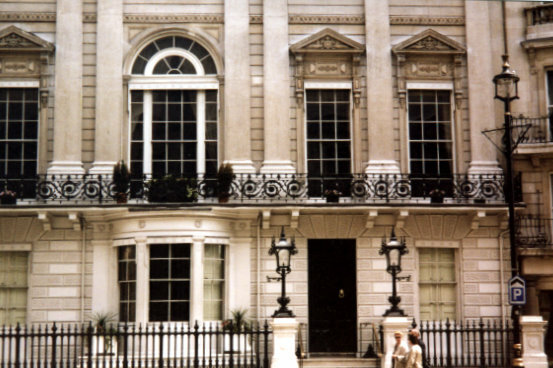 I visited Mayfair in my imagination so frequently that I knew it by heart—or thought I did. 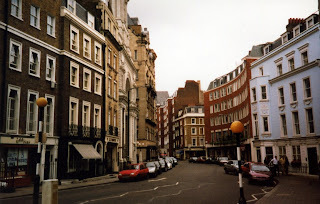 But I was unprepared for the emotions that hit me in London, after The Nobody was published, when I sought out Curzon Street and viewed the, er, scene of the crime. I imagine I felt very much like C.S. Lewis would have felt, strolling through Cair Paravel. Or L. Frank Baum, vacationing in Oz. Here I stood, in a place I had invented – a place inhabited by my own fictional characters – and its pavement was just as firm beneath my feet as the sidewalks of Sacramento. With stars in my eyes and a camera in my hand, I dragged my unfortunate family (on foot) all over Mayfair. The sensation was indescribable. I was exploring a place every bit as fictional, to me, as Narnia or Neverland. And every bit as beloved. I feel very fortunate to have had a chance to tramp through Mayfair. 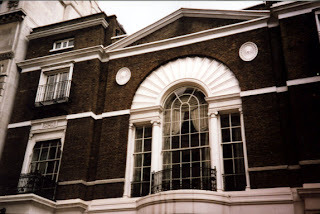 Much has changed, naturally, but the bones of the Regency are still visible beneath its 21st century skin. Diane Farr is an award-winning author of traditional Regency romances and Regency-set historicals. 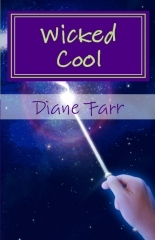 Her latest venture is something different: Wicked Cool, a fast, fun read suitable for teens--and everyone else, she hopes. You can join her on Facebook at www.facebook.com/dianefarrpage or follow her on Twitter at @DianeFarr. 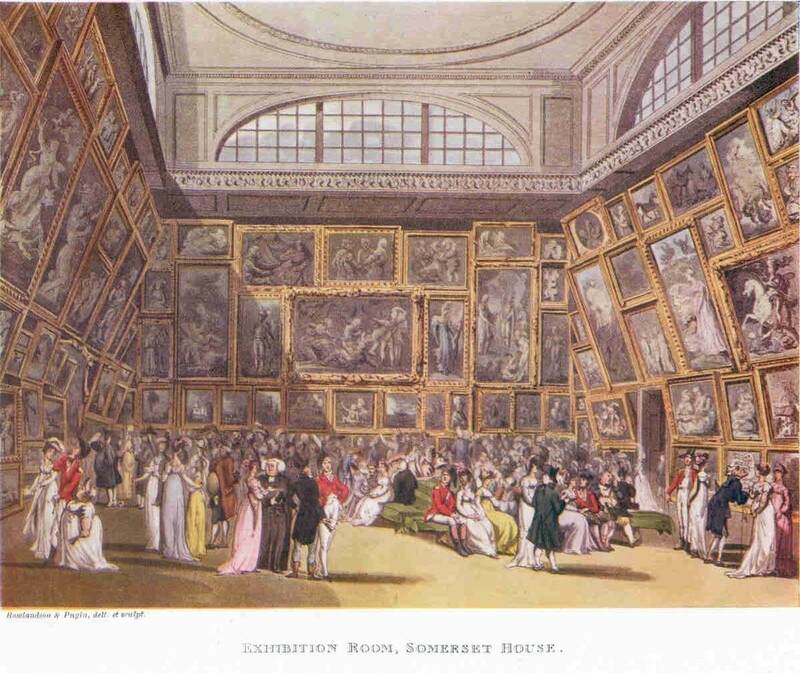 In July of 1811, as during the other summers of the Regency, was notable for art exhibitions. 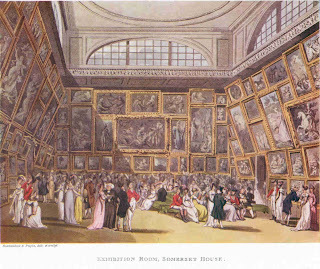 The Royal Academy, the British Institution, the Society of Painters in Water Colours, and the Associated Painters in Water Colours all held their individual shows. And the critics were out in force. Posterity and the intervening two hundred years have determined which of the painters of the Regency are now considered great artists. But the opinions of the time are fascinating, and no less pointed than are today's critical remarks. - on West's Christ Healing the Sick in the Temple "Why must he [West] adopt the nonsensical, traditionary colours of Christ's dress; always red and blue?" 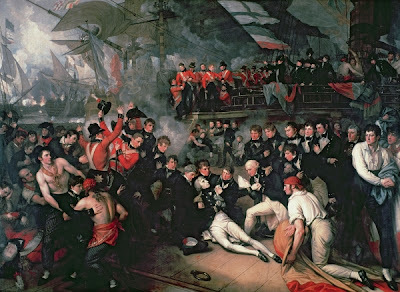 - on West's Death of Lord Nelson "We should also have recommended a more careful portrait of his Lordship's person. He will now be thought by posterity a taller man than he really was." Of another famous artist, the reviewer tartly states "Mr. Fuseli continues to amuse himself with Ghosts and Spectres." 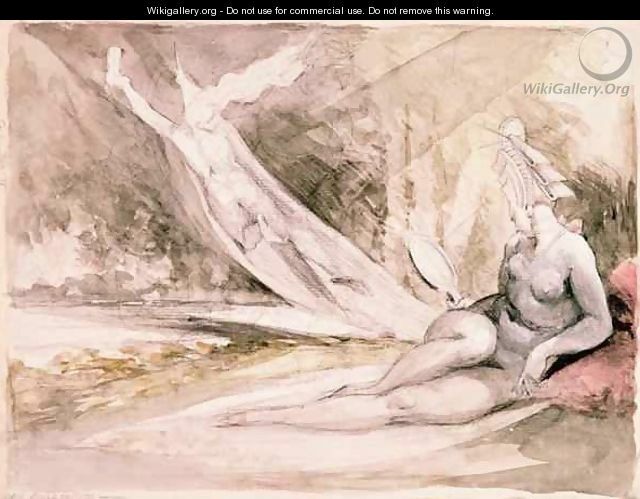 Of the landscapes exhibited, the writers comments "...they may be very correct as to resemblance; but not all of them are excellent as pictures." The Portraits he dismisses with "...we have seen a better shew[sic] of heads..."
The critic views the exhibition at the British Institution more favourably, and he wonders if the pictures are more select because of the absence of portraits. Nevertheless, his comments are stringent. - "Hilton's Entombing of Christ, has the fault of resembling the compositions of the old Italian masters: his Christ also, is rather fifty than thirty years of age..."
- "Hall's Haemon and Antigone, is a good attempt...but why dabble the lights about, like scattered grapes..."
- "Mr. Heaphy might chuse[sic]better subjects." One of his better subjects? The Associated Painters in Water Colours exhibited in Bond Street that year, and though our critic enjoyed the landscapes presented, he was less than complimentary about the other works presented. 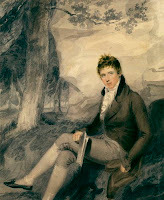 "If any proof were necessary of the difficulty of managing figures, especially naked, and classical or poetical figures, in water colours, we should appeal to the judgment of any practised eye on performances in this exhibition..."
Next week, Diane Farr will be visiting to talk about her walk through Mayfair, and her love of Regency London. 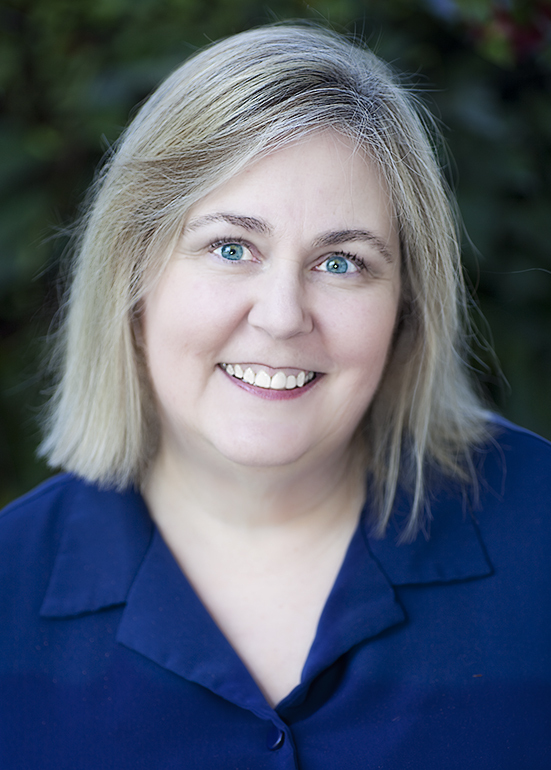 Diane is an award-winning author of traditional Regency romances and Regency-set historicals. You can join her on Facebook at www.facebook.com/dianefarrpage or follow her on Twitter at @DianeFarr. "Last night the Prince Regent gave a ball and supper to a numerous and splendid party. By the heavy and incessant rain which fell during the day, considerable damage was done to the tents erected on the lawn at Carlton-house, and it was feared they could not be used; however, the preparations went on. The entrance to these temporary erections was from the supper-rooms, along a temporary passage about sixty yards in length, boarded, and covered in with canvas, lined with green glaze cotton, decorated with artificial flowers, and the whole illuminated by chandeliers at proper intervals. The tents were arranged on each side of this passage or promenade, and their entrances were hung with curtains, festooned with artificial flowers. The tents were eighteen in all, and supper was to be laid in each of them for twenty-eight persons. 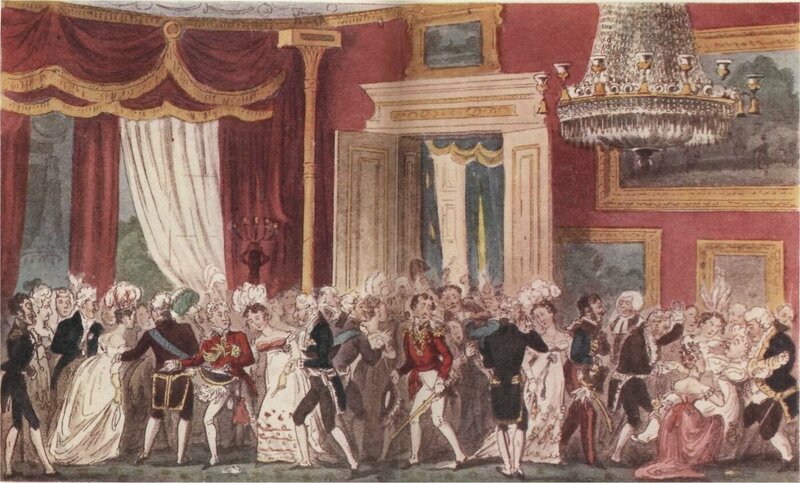 At the extremity of the promenade was the Prince Regent's tent, which was lined with light printed cotton, and the centre pole ornamented with artificial flowers. About nine o'clock, the Queen and the Princesses proceeded in their chairs from the Queen's Palace to Carlton-house. The company began to arrive after this in great numbers." That is over five hundred sitting down to dinner. The organization boggles the mind. Who was the overseer of all the details? Every aspect must have had a 'sub-contractor'. Secretaries for the invitations, and the menus. Designers to organize the set-up and the decorations. Tradesmen to execute the designs. And the suppliers--of cotton, canvas, tents, artificial flowers, etc. All wondering if they would be paid, and when! And then there was the meal--cooks, under-cooks, confectioners, right down to the scullery maids. I wonder how many hours it took to wash the dishes after such an event, and who over-saw the work. And what about the major-domo, the butler, the foot-men, and the maids who made the company comfortable and saw to their every need. It needed a master-mind to orchestrate all these details. 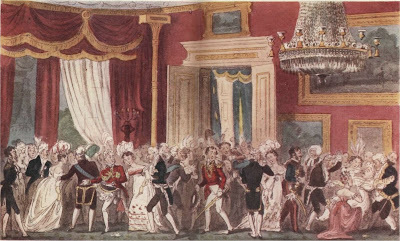 The Prince Regent's Fete held June 20, 1811 was an even more extravagant party--some 3,000 guests accommodated at Carlton-house, including French royalty as well as English. "The full band of the Guards, in their state-uniforms, play in the court-yard various martial airs." 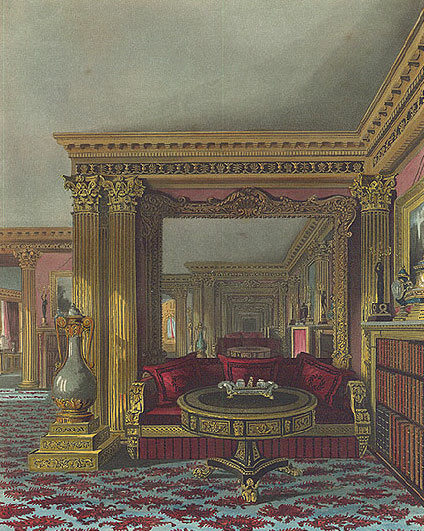 "The ball-room floors were chalked in beauitufl arabesque devices." "The hall was adorned with a variety of shrubs, and an additional number of large lanthorns and patent-lamps." 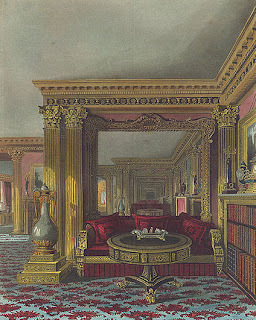 "The gold-room shone with unequalled spelndour; the ceiling and walls here are painted delicately, on a ground of gold." "Every praise is due to the superior officers of the household;--also to several noblemen, military officers, and other friends in the confidence of H.R.H. for all possible accommodation..."
"The Regent was also attended by a vast retinue, and was mounted on a beautiful grey charger, richly caparisoned; he was dressed in a full suit of General's regimentals, with the order of the garter, and a diamond star." It all required planning, and it all required staff. So here's to the Prince Regent's talented and, no doubt, long- suffering party planners. By all accounts they did a splendid job with spectacle after spectacle. I hope they got thanked--and I do hope they received their wages! "1500 pounds will be given to any person who has influence to procure for the advertiser an appointment of writer either to Bengal or Madras. Address to A.Z. at the British Coffee-house"
This advertisement, which appeared in an English newspaper in 1800, makes it clear that a position with the East India Company was a valuable commodity. A 'writer' was a clerk, and if you were a clerk looking for a position in Bengal or Madras, you were almost certainly looking for work with the East India Company. Such a job ensured a wealthy future, always provided you lived through the dangerous sea voyage, the difficult climate, and the fevers and sicknesses of the sub-continent. The advertiser's investment of 1500₤ could be recouped many times over. The British East India Company (BEIC) was a venture for pursuing trade with India and China that was already two hundred years old by the time of the Regency. But it was from about 1750 to 1850 that it virtually ruled India, and made fortunes for its directors, its merchants, and even its clerks or, as they were called, writers. Positions as writers might be bought and sold and were undoubtedly objects, occasionally, of corrupt practice. But there was another way to obtain a writership, and that was through education. 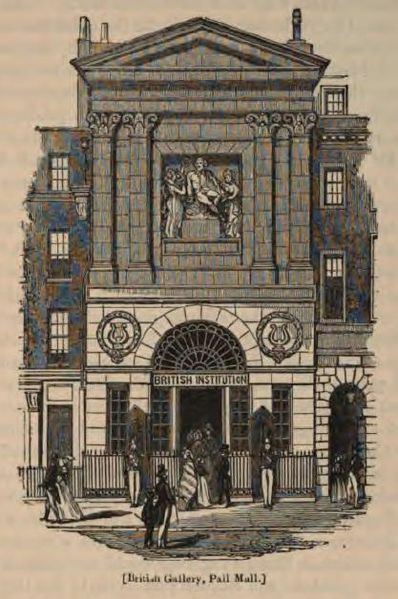 Education specifically at the East India College. The East India College was established in 1806 to train young men, sixteen to eighteen years of age, for positions of clerks with the civil service in the East. It was situated temporarily at first in Hertford Castle which was a property of the Cecil family and leased out to various tenants over many years. In 1809, the College moved to a purpose-built facility at Hertford Heath--four classically designed buildings surrounding a quadrangle which was the largest of its type in Britain. Its architect was William Wilkins, who also designed the National Gallery in London. Below is a modern photograph of Haileybury College, which is housed in the East India College buildings. I have altered the photograph, removing a dome added in 1877, in the hope that it simulates the appearance of the College in about 1810. The hard work undertaken by the students of the College had a purpose which outstripped the classics courses of the scholarly universities. There was a Classical and General Literature course but practicalities were emphasized. Languages were chief among the classes--Hindustani, Urdu, Bengali, Sanskrit, Arabic and Persian were all taught, by prominent scholars. Thomas Malthus, the great economics philosopher, was professor of Political Economy from the origin of the College to 1834. Law, Mathematics and Natural Philosophy were also important courses of training at the College in preparation for residence and work in a very different world. Imagine the excitement of a young man of the middle or gentry classes, nominated by the directors of the BEIC for training at the College. It was a passport to a new world, to adventure, and to a secure future. The high spirits in the College Quad can only be imagined, and nearby there was a pub, The East India College Arms (it still exists as The College Arms) which must have seen its share of larks undertaken by the students. 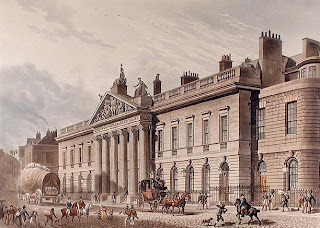 The 'nabobs' of Regency fiction perhaps began their careers at the East India Company College! Ladies in Regency novels frequently drink ratafia. It has become the quintessential Regency romance drink, in fact, favoured by authors. 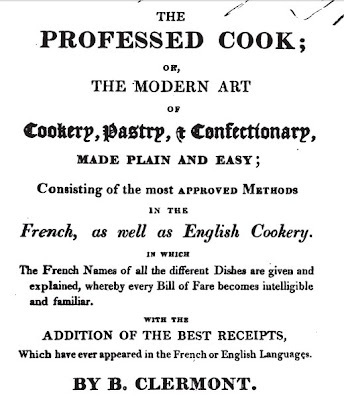 I knew it was a sweet wine, but I really knew nothing more until I came across several recipes and options for making ratafia in "The Professed Cook", a wonderful cookery from 1812 which I found downloadable at Google Books. 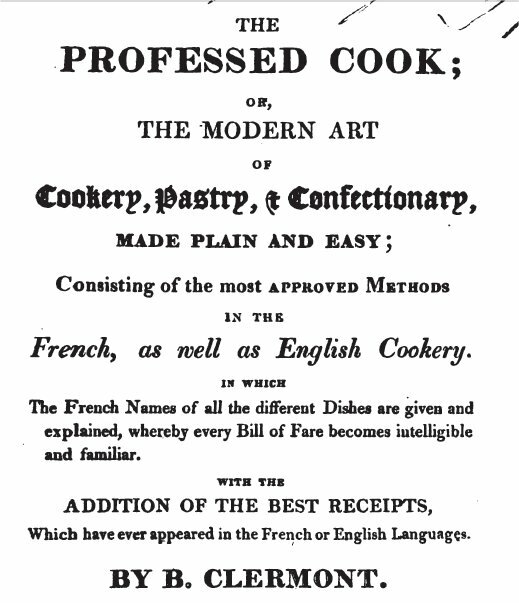 "The Professed Cook" has a section titled Des Ratafiats or Of sweet Drams or Cordials. It includes some ten recipes for different versions of ratafia. They all begin with brandy and they all take thirty to forty days to prepare and infuse. The adventurous cook, it seems, can add almost anything to the brandy. Some of the ingredients listed in "The Professed Cook" include walnuts, quinces, orange-flowers, juniper-berries, lemon-peel, aniseseeds and apricots. Plenty of sugar is included and three spices in these receipts in particular--coriander, cinnamon and cloves. 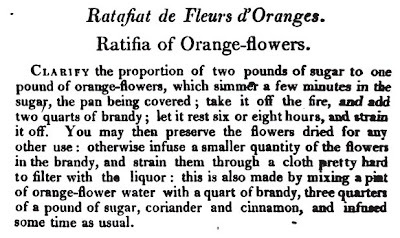 Ratafia was commercially bottled during the Regency and sold at wine merchants like Berry Bros. and Rudd in London. Supplies must have been limited during the Napoleonic Wars and no doubt ratafia, like so many other wines, was a prime article for smugglers. Ratafia is still commercially produced today. 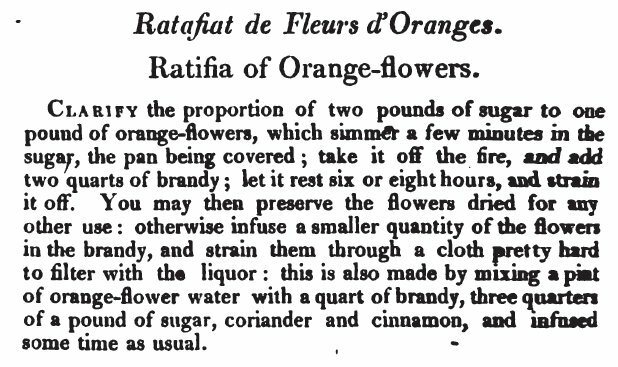 Presumably ratafia was considered a drink suitable for ladies because of the addition of fruit, sugar and spices. The brandy was there, but it was diluted and infused with innocuous ingredients which would not turn 'weak' female heads. Grrrr! One of my heroines demanded madeira instead! Modern day ratafia has an alcohol content of 25%; if the Regency version was similar, the ladies should not have been supping it so freely! I would like to buy and sample some ratafia; I don't think I'll try my hand at making it!